Discussion in 'Sega Dreamcast Development and Research' started by Renard, Oct 3, 2018. Thanks - but I think I'm halfway there. I believe I've completely documented the "Amigo"blocks (difficulty levels) EASY, NORM, HARD, SUPR. One could create a level editor for this (with audio sync and player movements) without problems. Amigo blocks DA_E, DA_N, DA_H and DA_S are the equivalent in hustle mode, and very similar in format, but I'm not sure about the meaning of a few bits (probably related to the speed of the movements). Still, creating / editing hustle mode levels should not be difficult. I didn't spend much time with HEAD, CAM_ and ACT_ blocks, though. They seem to handle camera position and movements, as well as "actors" and "extras". There's some debug code in the game that could shed a light on this - I've seen mentions of "stand, jump, side_step, fr_bk_step, act_bakuten, act_object" (BTW, "bakuten" is "backflip" in Japanese). To create/edit the background animations, these blocks must be understood. If anyone wants to help with that, I'd be grateful. P.S. : I also would love to have native Python libraries to read & write files (such as AFS, PVR, TPL, ...) to automate file conversions and thus translation of the game. I could do it all manually with currently available tools, but that's not fun - and such libraries would help in other projects as well. 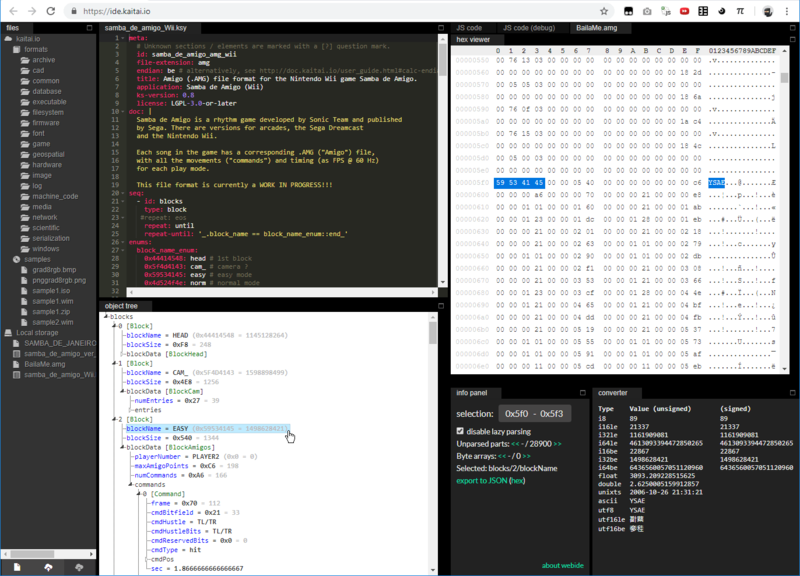 If anyone is interested, check out the Kaitai Struct Web IDE, where you can load a .ksy file (defining a file structure), load a file (such as a DC .AMG Amigo file) and see the data being mapped to the structure that you can edit in real time. It would be a great reverse engineering tool just for that, but it also can create code to parse the structure in many different languages as well! So if anyone could contribute with a Kaitai Struct file format as well, it would be awesome! P.P.S. : I tried using the Null DC debugger, but the debugger seems to be buggy! Does anyone recommend another emulator with a debugger (that works)? Renard, fafadou and americandad like this. As you can see in the video above, I replaced "Tubthumping" with "Arriba Allez" with v. 0.2 of amg_explorer, and even the animations work correctly! I described (almost) completely the .AMG format, both in text format and in Kaitai Struct files. Please see https://github.com/AltoRetrato/samba-de-amigo-2k_modding for details. This means that song conversion is basically done! I didn't test anything besides what's in the video, though, so bug reports, bug fixes and suggestions are welcome. MetalliC, Renard, MastaG and 3 others like this. I've finally been able to play around a bit with Kaitai. I'm really impressed, this is a fantastic tool. Combined with the documentation you already wrote, this is absolutely bonkers! Edit: also, Hustle mode (raw import from the Wii data) crashes the real hardware too in my tests, not just the emulator. americandad and fafadou like this.